In October of 2016 the organizers of the World OutGames promised an $11 million event with 15,000 registrants. It didn’t even come close. On opening day they had collected about $1.4 million in revenues while only 2,100 people had registered – forcing organizers to cancel most of the events. The City of Miami Beach conducted a financial audit of the games to determine what went wrong. Mostly it showed there was a lack oversight, while city officials put too much faith in organizers. For instance, in March, organizers revised their estimates with a new budget of $2.36 million – a mere 20 percent of what they planned for six months prior. They ended up collecting about $1.4 million, half of what they hoped for in March. The audit showed that almost all that money had been spent, leaving $7,000 left in their bank account. The audit focused on the numbers so it doesn’t show how organizers could have realistically believed they would be able to meet that $11 million budget while getting 12,000 more people to register in the last eight months leading up to the games. The audit given to city commissioners last week showed a lack of oversight and shoddy accounting. It also showed organizers spent almost $600,000 on consulting, and advertising and promotional fees. The audit does appear to place some of the blame on the board. “In addition, there was a lack of oversight from the Board of Directors as staging the World OutGames became the responsibility primarily of a handful of individuals who appeared to struggle with staging such a large event,” the report continues. According to the OutGames program then current board members included: Bruce Townsend, Ivan Cano, Keith Hart, Jerry Torres, George Neary, and Nick Tierno. Past members included Steve Adkins, Bob Balsam (deceased), Cindy Brown, Karen Brown, Michael Góngora, Richard Murry and Jose Sotolongo. The highest paid official was OutGames CEO Ivan Cano, who walked away with $106,992 in consulting fees. To put that into context, only $65,475 was spent on sporting events. Regardless, OutGames organizers appeared to have attempted to deceive some hotels it worked with on its tax-exempt status. OutGames was not a 501c3 nonprofit, even though at one point they were attempting to become one. In order to assist the organization before they got their own tax exempt status, the Miami-Dade Gay and Lesbian Chamber of Commerce’s foundation agreed to act as its financial agent, but only for the purposes of securing two grants. Any other attempted use of the foundation’s tax exempt status was not appropriate said Steve Adkins, President of the MDGLCC. “Additionally, [OutGames] failed to properly qualify for the tax-exempt status they represented they maintained, thereby increasing its liabilities to The National Hotel and their booked participants,” reads a statement from National Hotel in Miami. The MDGLCC found this out when a hotel contacted them to confirm the arrangement. “We were not pleased,” Adkins said. 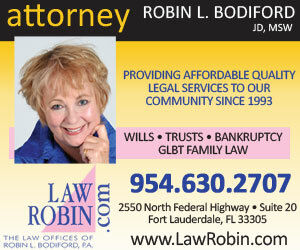 As soon as the games were canceled Adkins said MDGLCC resigned as their fiscal agent. When organizers canceled most of the events on opening day, it left athletes and locals infuriated. It’s still unclear why they waited until the last minute. Many athletes were en route to Miami and had no idea until they landed that their events had been canceled. Even more troubling is that some athletes paid for their hotel stays through OutGames, but organizers never paid the hotel, forcing them to pay for their stay again, or find other arrangements. After the cancellation announcement, most of the board immediately resigned. Not everything was cancelled though. The human rights conference went on as scheduled despite the drama elsewhere. Lynare Robbins, the person in charge of that event, also resigned from her position, but decided to stay on without pay to make sure the event continued. But to some behind the scenes organizers it was obvious that the sporting events were not going to happen. One week prior to the event Ruiz spoke with OutGames treasurer Keith Hart, who was supposed to call the next day to finalize details including payment. Ruiz never heard from anyone from OutGames again. Ruiz said organizers initially hired him to plan a large-scale event that would have included 12 sports and cost upwards of $200,000. But as the event approached organizers continued to downsize. “As the event got closer and closer, we got more nervous, there was no signed agreement, and they constantly asked us to revamp our proposal,” Ruiz said. When organizers — including the board — walked away, Miami Beach city officials, Steve Adkins, and other locals stepped in to reschedule as many events as possible. The 2020 World OutGames was slated to take place in Winnipeg, Canada. Last week the event was officially canceled. "With the incident that happened in Miami this past June and how the athletes were treated, we feel that we are no longer in a position to deliver an exceptional experience for LGBTTQ* athletes under the OutGames banner," Jonathan Niemczak, chair of the 2020 planning committee, told CBCNews. View the full audit here.